As people across the globe celebrated World Wetlands Day on 2 February, New Zealand should be very proud of its achievements in protecting vulnerable wetlands. The International Fund for Animal Welfare (IFAW) supports the Mangere Mountain Education Centre by funding an information display which helps in its vital work encouraging the protection of the Manukau Harbour Wetlands for its wide variety of water or wading birds. The Mangere Sewage treatment plant and particularly the oxidation ponds covered 500ha of Manukau Harbour since 1960. Through new processes developed to deal with waste the ponds were no longer needed. In May 2001 the sea walls were knocked down and the tide was allowed to flow in. This redevelopment has meant more mudflats for the birds to feed on. Rejuvenating roost sites away from the nearby Auckland airport, avoids birds roosting in areas of short grass near runway tarmacs. This largest coastal marine restoration project in New Zealand leads an example to the rest of the world. Migratory birds and their habitat are under threat globally. Asia hosts vital staging sites in the birds long migration from the high Arctic, a journey of approximately 11,000kms. Long distance migrant waders habitats are in danger by huge population pressures. These are becoming destroyed by land-claim, poor management, and natural resources exploitation. IFAW with the IFAW Waderbird display. Every spring 200,000 wader birds arrive in New Zealand from the high Arctic, a journey of approximately 11,000kms, and thousands of them spend the summer on the Manukau, Firth of Thames and other wetlands throughout New Zealand. "The Manukau is a very special place. It is our responsibility to respect the Harbour and the natural life within and around it," says Keith Woodley, Manager of the Miranda Shorebird Centre. "By protecting wetlands, we help to ensure migratory birds will always find a haven at the end of their epic journeys." 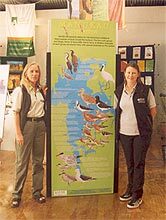 The Mangere Mountain Education Centre worked closely with the Department of Conservation and IFAW to make a display that educates people on the multitude of birds, migratory routes and the history of the rejuvenation of the Harbour. Mick McIntyre, IFAW Asia Pacific Director, highlighted the importance of partnerships in preserving delicate wetland areas. "It is important we work together to protect the fragile ecosystems of the wetlands and remain vigilant towards the many threats to wader bird habitats such as development, stormwater, industrial pollution and other disturbances including dogs, machinery and people, " he said. Miranda, New Zealand, Manukau Harbour. Not far from Auckland Airport, the centre is a great place to visit and learn about the local environment, history and culture and the Mangere Mountains spiritual significance to Tangata Whenua. For further information visit www.mangeremountain.co.nz.